I love your drawing, keep it up! That is amazing. How many times have drawn that? I think what you have drawn is the best thing I have ever seen. I hope you draw more beautiful pictures. You are aaamazing! You should teach me how to do that! That's really cool. I LOVE looking at horse drawings. Love it! That's amazing! How do you draw that good? Really good drawing well done! You are way better at drawing than me. Plus I love horses! Wow! You've inspired me! I love the angle, the kindness of the horse's eyes, the shading, the detail. I would be proud of that beauty! Wow, that's really good I can draw that too, so that is really nice to know that other people like to draw horses. Keep drawing nickers and neighs. Wow, You draw everything correct! I want you to teach me! Awesome! I love pics of horse's eyes! I love it! you're really good at drawing horses. OH, WOW that drawing is amazing. I can also draw like that, but I am not that good at the eye of a horse. I hope you can teach me. This is amazing! I could draw for weeks and weeks and not even get anything close to that! This is one incredible piece of art. Good work! that looks so real! i love it, they say how you done it everyone likes it. WOW WELL DONE YOU MUST HAVE WON LOTS OF ART COMPETITION! bravo, my style is similar!! great job! this drawing is absolutely amazing! i wish i could draw like that! That is sooooo good!!! I really like that you can see expression in the "Horse's Eye." 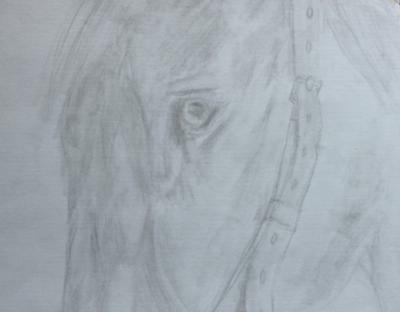 I like to draw horses too, but I'm not that good. Great job!!!! it looks dark but it needs bright white paper, it looks good so far. I think it is amazing!!!!! your really good! i love to draw horses galore!!! your drawing is amazing, I can't draw like that. that is awesome! i wish i could draw as good as u. i'm a really bad drawer but i still love to draw. *Stares* HOW did you DO that? It's COMPLETELY amazing! HOW DID U DO THAT!!!!! your drawing has great line detail, but you need to shade darker. I had a little trouble seeing the sketch at first. WOW this is amazing, i wish i could draw horses. your drawing is supper awesome. wow that's brilliant. how did you do that? well done. uh I don't no what to say, it's a super drawing. I like it! I also draw horses, but the tack I draw stinks! by: I am actually a Barrel Racer!!!! This is a very detailed drawing..... I would upload some if I knew how.......... But your very good at shading and the shape processing of a horses anatomy. Good job! Cool!! That's a great drawing!! Great, but shade much, much darker. It is not very visible. It has great lines, but shade a bit darker. Trust me, I used to shade very light, but all of the shading effort is worth the work! I know this because I make lots of animal drawings for people, and they are much more satisfied with a darker value. Keep up the great lines you already have, though! That's such an awesome drawing! I'm not good at drawing eyes, so I always just draw dots. I wish I was as good as you! i took a picture of a horse's eye that my sister was riding and it was really good. my older sister is going to draw it. its the best ever, how do you do that? hey! i like it. I'm Stacia from youth group. :). i checked this place out, and saw this drawing that looked like yours from facebook so i checked it out. I love this picture. I'm not the Sydney, I'm Sydney S, my name is Sydney too. I love your drawing. That is really good!!! Thats really nice! Great detail,it looks alot like my neighbor's horse.